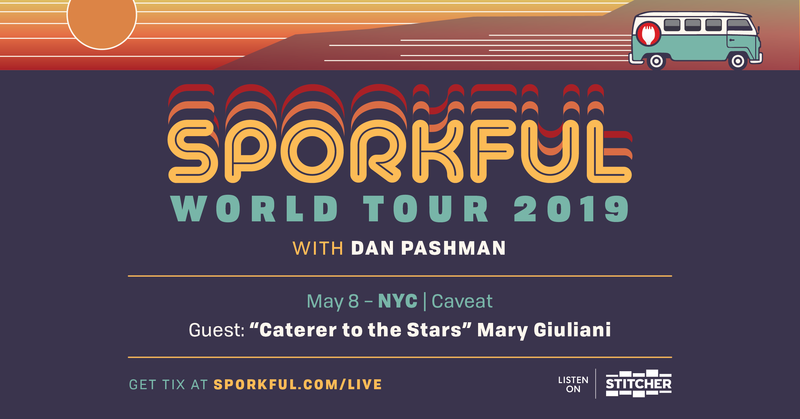 In this live taping of The Sporkful food podcast, author and "caterer to the stars" Mary Giuliani talks with host Dan Pashman about the foods she grew up eating on Long Island, how her training in theater prepared her to become a caterer, what it's really like behind the scenes of the glamorous parties she caters, and, of course, her enduring love affair with pigs in a blanket. The Sporkful isn't for foodies, it's for eaters. It's a podcast where host Dan Pashman obsesses about food to learn more about people, whether that means talking with people like Padma Lakshmi, Weird Al, Phoebe Robinson, and Amy Sedaris, discussing deeper issues of food and identity, or arguing about the ideal surface-area-to-volume ratio of ice cubes. The Sporkful is the #1 food podcast in Apple Podcasts. It's produced by Stitcher. Dan Pashman is the James Beard Award-winning creator and host of The Sporkful food podcast at Stitcher and Cooking Channel's You're Eating It Wrong. He's a contributor to NPR and has appeared on shows as varied as Radiolab, Planet Money, WTF with Marc Maron, the Today Show, and Guy’s Grocery Games. As host of The Sporkful Dan has interviewed Rachel Maddow, Weird Al, Rosie Perez, Guy Fieri, Amy Sedaris, Kumail Nanjiani, Alton Brown, Padma Lakshmi, Jim Gaffigan and many more. Mary Giuliani is an author, party and lifestyle expert, and founder and CEO of Mary Giuliani Catering and Events and Giuliani Social. Her newest book Tiny Hot Dogs: A Memoir In Small Bites, was published April 9th, 2019 from Running Press (a division of Hachette Book Group). Mary’s first book, The Cocktail Party (Eat, Drink, Play, Recover) came out in 2015. A graduate of Georgetown University, Mary resides in New York’s Chelsea neighborhood and Woodstock, New York with her husband Ryan, and daughter Gala.